Find out if our program is right for you! We invite all potential students/athletes who are interested in finding the best academic and athletic progressive youth hockey training program in Michigan to shadow a player for a day for free. Participate in warm ups and receive on ice personal instruction. 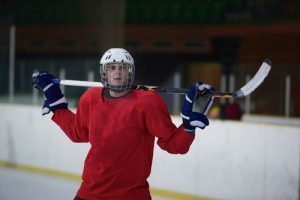 Practice shooting, receive instruction on skating techniques, and learn proper stick handling methods. Participate in an instructional scrimmage. Work out in our state-of-the art gym and utilize our off-ice shooting lane. Meet our professional level coaches and instructors. Tour our classroom facilities and meet our in-house, certified teacher, Mary Colombo. Rolston Academy offers an innovative approach to training youth hockey players by combining academics with core athletics. The unique program is led by former Boston Bruin, NHL pro, and Olympic Medalist, Brian Rolston. The goal at Rolston Academy is to blend cutting edge hockey training with student centered learning. Every player is different and has different skills that impact how they learn both on the ice and in the classroom. Rolston Academy provides students with the opportunity to receive a NCAA accredited education while optimizing the opportunity to achieve their goals in becoming Division I and professional athletes. Players receive personal training and instruction both on and off the ice from retired professional NHL players and world-renowned instructors and coaches. Individually designed programs include strength training and conditioning, as well as nutritional aspects. Daily off-ice focused activities emphasize leadership development. Facility features dedicated ice arena, artificial turf for off-ice training, a state-of-the-art gym, new team locker room facilities, and arena warming area. Students enroll in Michigan Connection Academy, a tuition-free online public school that allows them to learn in a comfortable yet stimulating environment, with a curriculum that meets state education standards. Dedicated classroom and facilities for academic study. Accredited teacher on site to assist players with their school work. The Rolston Hockey Academy program is specifically geared for players who want to take their game to the next level. Our goal is to make sure each student learns the skills necessary to make the transition to the higher levels.